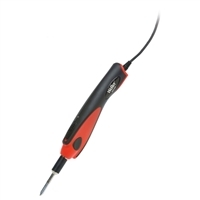 Pro Series High Performance Soldering Iron. Super-fast heat-up! Heats up to working temperature in just 35 seconds! Patented design provides performance equivalent to a 60 watt iron. Red power-on LED changes to green when iron reaches working temperature. LED work light illuminates working surface in low-light conditions.